Virginia Burt FCSLA, FASLA, of Virginia Burt Designs will be speaking at the Illinois Chapter of the American Society of Landscape Architects (ILASLA) on Thursday June 2nd. 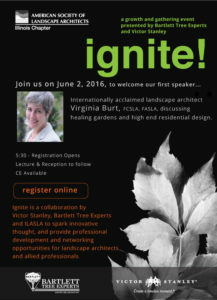 The ILASLA is welcoming a new speaker series to spark your imagination called Ignite! This is a a growth and gathering event and is presented by Bartlett Tree Experts and Victor Stanley. Virginia, the first speaker in the series, will be discussing healing gardens and high end residential design. Please see the ILASLA website for all of the details. The American Society of Landscape Architects was organized in 1899 as the first professional organization for landscape architects. Today, almost 18,000 landscape architects in public, private and academic practice nationwide are members of the ASLA. Illinois has one of the largest chapters of ASLA in the nation with almost 500 members.